Marinate the steak in 1/4 cup of the balsamic dressing for at least 1 hour. Combine the squash, almonds, salt, chili powder, coriander, cayenne and olive oil in a bowl and toss to combine and coat the squash. Roast the squash mixture for 20-25 minutes or until the squash is soft, stirring every few minutes to prevent the almonds from burning. Towards the end of roasting the squash, prepare the steak: Heat a ribbed cast iron pan or griddle (ribbed isn't necessary but it makes nice grill marks) over medium high heat. Once hot, spray with vegetable spray and add the marinated steak. Sear on both sides until cooked to desired doneness. Transfer the steak to a cutting board and let rest for a couple of minutes. Use a sharp knife to cut the steak into very thin slices. 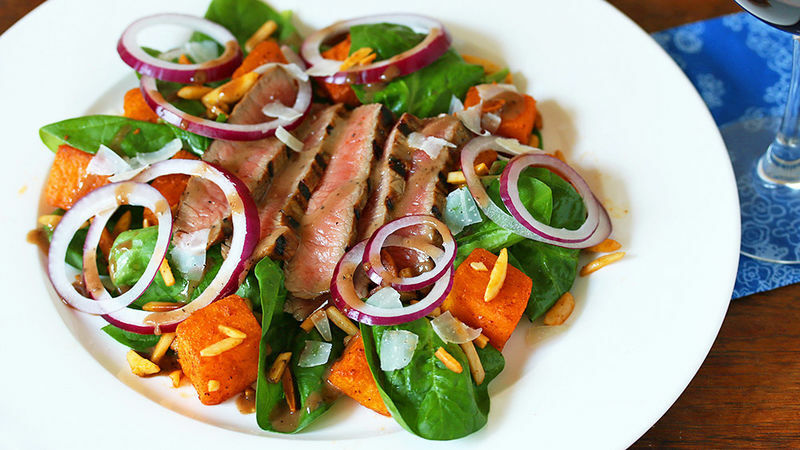 Assemble the spinach leaves on the plates, top with some of the butternut squash mixture, lay some steak slices on top, add some red onion slices, drizzle with balsamic dressing and sprinkle with Parmesan cheese. Serve immediately. To make this recipe easier, buy pre-packaged butternut squash (found in the refrigerated section, usually in 1-inch cubes). Simply cut them in half to make 1/2-inch cubes. This colorful spinach salad will dress up any dinner table. This recipe requires only a few steps and the result is something deliciously gourmet. Sweet butternut squash is roasted with slivered almonds and spices, mixed with fresh, crispy spinach, topped with slices of tender and juicy marinated steak and red onion hoops, and sprinkled with Parmesan cheese. A tangy balsamic dressing is served along with the salad. You can use pre-packaged butternut squash for convenience and minimizing prep time. This is a wonderful, healthy salad for any occasion. Its flavor and colorful appearance will win you plenty of compliments! First, you'll want to marinate the steak in 1/4 cup of balsamic dressing. Then preheat the oven to 350ºF. The prepackaged butternut squash comes in cubes that are approximately 1-inch across. Cut those in half. Place them in a bowl with the slivered almonds, olive oil, salt, chili powder, ground coriander and cayenne pepper. Toss to combine. Spread the squash mixture out on a lined cookie sheet. Roast in the oven for 20-25 minutes or until the squash is soft, stirring every few minutes to prevent the almonds from burning. While the squash mixture is baking, prepare the steak. The steak has been marinating in the balsamic dressing for a few hours already at this point. Heat a ribbed cast iron pan or griddle (if you don't have a ribbed one that's fine, it just looks cooler) over medium-high heat and let it get really hot. Spray with some vegetable spray and add the steak, searing on both sides until cooked to desired doneness. Transfer the steak to a cutting board and let it rest for a couple of minutes. Use a sharp knife to cut the steak into thin strips. Assemble the spinach leaves on plates along with some of the squash/almond mixture, lay some steak slices on top with a few slices of red onion, drizzle with balsamic dressing and sprinkle with Parmesan cheese. Serve immediately and enjoy! For more healthy and delicious squash recipes, visit Kimberly's food blog, The Daring Gourmet.